Oftentimes, pets from pet stores are fed with commercial dog food; and chances are the puppies you brought home are not reared on a homemade diet. You’re hoping that once you get a puppy home, you can feed it with natural, homemade dog food. To ease the transition, here are some simple tips to keep in mind. Start out by serving your puppy with small, frequent meals. 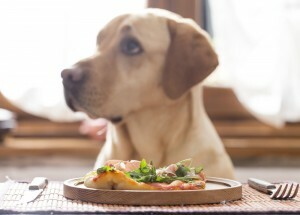 Although some dogs do fine with immediate diet switching from commercial to homemade, others may not know what to do with raw food when first introduced to it. Try mixing raw dog food with some kibble to gradually phase out the kibble from your puppy’s diet. Do what you’re comfortable with and what works best for your dog. Notice how your pup responds to the change in diet and adjust the pace of transition accordingly. If your dog seems not adjusted yet and you feel like he prefers commercial food, keep on serving mixed diet—half commercial, half homemade—every meal. Gradually decrease the amount of commercial food from his diet until he’s ready to take on a full homemade meal. It’s important to make mealtimes as stress-free as possible and to keep the feeding times on schedule. Do not get disappointed if your pup seems uninterested on the food you served, nor force your dog to take the food you prepared. Aside from stressing yourself, you’re pressuring your little pet as well. Just pick up the bowl, walk away, and the offer the food again later. 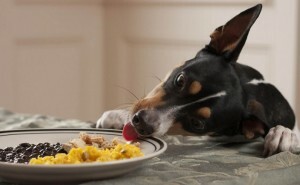 Remember that dogs need to eliminate waste after every meal, and often likes to sleep after their meal and potty break. Adding some digestive enzymes, like Berte’s Zymes, to your pet’s meal is helpful to ease the transition from commercial diet to homemade one. Give your small to medium-sized dogs a quarter of a tablet, while half-a tablet for larger ones with their meals. Switching your puppy’s diet can cause him gastric problem. Stomach upsets are common and can be cured easily. If your dog experiences one, fast him for a couple of hours before giving him more food. 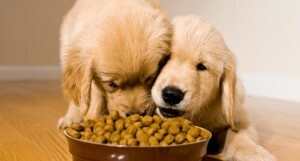 When preparing for your puppy’s next meal, serve it in smaller portions and reduce the fat content as well. If problems persist after fasting, take him to a veterinarian to check whether it’s because of a more serious health problem. Since your dog is having home-prepared meals, it can be a challenge to guarantee that your pet is getting the right amount of vitamins and nutrients from its food. To cover gaps, add multivitamins and food supplements to your dog’s diet. Find out what your dog’s diet contains and then add what’s missing to ensure complete nutrition. Have cabbages on hand when transitioning your dog’s diet to homemade. It is great for calming a troubled stomach. Boil cabbage for 15 to 20 minutes and then let it cool. Give half a teaspoon for every 10 pounds of your dog’s body weight. Overeating is the most common cause of diarrhea among dogs. Try serving your dog with plain canned pumpkin to soften his stools. Give half a teaspoon for dogs weighing 30 pounds, one teaspoon for dogs between 30 and 60 pounds, and one tablespoon for larger dogs. If all your efforts of transitioning your dog’s diet from commercial to homemade aren’t working, no matter how slow you go with the food change, consider going back to the old food as your dog may be allergic to or experiences certain internal issues with the ones you provide. If more serious health problems arise during the transition, consult a Singapore vet for professional assistance. Homemade meals are said to provide more benefits for your puppy, so long as they are composed of healthy and nutritious components. Make the transition easy for your little furball by fully understanding his needs and knowing the right steps to take.